A concert performed by the Tokyo Philharmonic Choir conducted by Kazuki Yamada. The program includes music by Toru Takemitsu, Minao Shibata, Stephen Leek, Raymond Murray Schafer, and Astor Piazzolla. 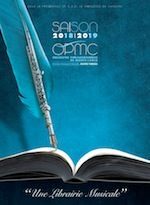 A Monte Carlo Philharmonic Orchestra 2018-19 Spiritual Concert performance.